Do hCG Weight Loss Injections Really Suppress Appetite? Human chorionic gonadotropin, or hCG provides nourishment to the fetus and promotes the production of various other hormones. As hCG is produced in the placenta, it is often referred to as a pregnancy hormone. hCG is often prescribed to be used as an aid to assist with losing weight, although this indication is not approved by the FDA. 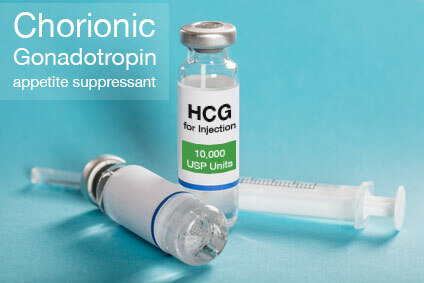 hCG has been accepted by the American Food and Drug Administration (FDA) for the treatment of hormonal abnormalities and infertility, but physicians are also allowed to prescribe it as an appetite suppressant, although this specific application has in fact not been approved. In this application, hCG is used as an injection and is prescribed in combination with a diet with very low calorie intake. 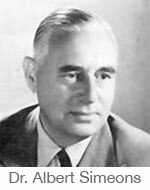 Dr. Albert Simeons, an endocrinologist from Britain, worked with obese young Indian men in the 1950s. Simeons discovered that when he injected hCG directly into the muscle, it promoted the transfer of fat away from the areas where it normally collects, such as the abdomen, hips, buttocks and thighs. Additionally, the body uses the fat as fuel during this process as it is being transferred. To promote the loss of weight, Simeons prescribed a diet with very low calories (500 per day) to his overweight patients. He found that while they were using the hormone, the dieters were able to better manage consuming less food than what they were used to. The FDA does however not agree with this viewpoint. A major characteristics of hCG diets is calorie restriction to the extreme. The National Institutes of Health recommends that males should consume 1,500 calories per day, while the recommendation for females is a daily intake of 1,200 calories. Dieters on the hCG Diet are only allowed to eat less than half that number. Normally, eating such small amount of calories would result in a voracious appetite. Proponents of the hCG treatment claim that if they receive 125 IU of hormone per day, they notice a huge reduction in feeling hungry, they report that hCG works as an appetite suppressant. Simeons claims that although the hCG does not cause the weight to shift, the hormone can be linked to the body shape changing and that it definitely causes a reduction in hip circumference. The hCG diet follows multiple phases. The first phase consists of loading with calories. Dieters are advised to eat as much as they can for between two and seven days. 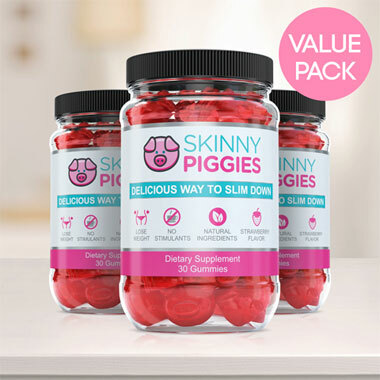 In his book, "Pounds and Inches," Simeons explains that patients can't be kept comfortably with only 500 calories per day unless they have a fair supply of fat reserves to start off with. On day one of the second phase, your doctor will start with hCG injections and calories are restricted from the third day of the second phase. hCG injections will continue for 23 days, while the calorie restrictive diet will last for 26 days. The extra three days of dieting at the close of the second phase allows your body the time needed to get completely rid of the hormone. According to Simeons, if calorie intake is increased while there is still hCG in your system, it will result in substantial weight gain. Simeons is extremely clear on what you should and shouldn't eat while on an hCG diet. In the morning, you may have a cup of tea or coffee with 1 tablespoon of milk and sweetened with a sugar replacement for breakfast. You're allowed 100 g protein for both dinner and lunch as well as fruit, toast or a breadstick, and plenty of vegetables. During the second phase, neither starches nor sugar is allowed. Advocates of the diet claim that it is typical to lose approximately 1 pound per day while using the hCG diet and that you won't feel hungry. The labeling approved by the FDA states that hCG hasn't been shown to be an effective supplemental treatment that will assist in reducing obesity. No evidence exists that weight loss will increase beyond what would normally occur with caloric restriction. The FDA further cites a lack of evidence for the claim that hCG will result in a 'normal' or more attractive distribution of fat, and that it reduces the hunger and uneasiness normally linked to calorie restricted diets. The FDA further states that as evidence proving an increase in weight loss is sparse, weight loss achieved is more likely to be due to the calorie restriction and not the hCG diet. The FDA also feels that hCG diets appear not to impact on fat distribution. There is also no proof that it reduces hunger pangs. If you are considering going on an hCG diet, discuss the advantages and disadvantages with your doctor first. The FDA names numerous side effects that could be experienced by anyone taking part in hCG supported weight loss. This list includes pain and possible infection of the site of the injection, as well as bigger risk of fatigue, headaches, swelling, irritability, breast tenderness, depression, blood clots and water retention. The sudden enlargement of ovaries is also mentioned and this side effect could potentially be life threatening. The FDA is very vocal on homeopathic hCG and advises consumers using this for weight loss to stop using the product immediately. 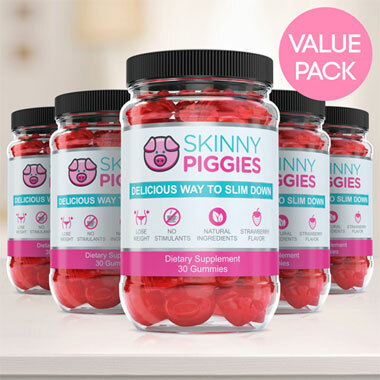 It goes further by recommending that the labeled dieting instructions should not be followed, and that the product should in fact be discarded. Patient who have reason to believe that they have, or are experiencing adverse effects resulting from using any of the hCG drug products for weight loss, should contact their doctor immediately. For more info visit FDA's website at HCG Diet Products are Illegal. For more information on prescription appetite suppressant drugs approved by the Food and Drug Administration visit FDA approved appetite suppressants. 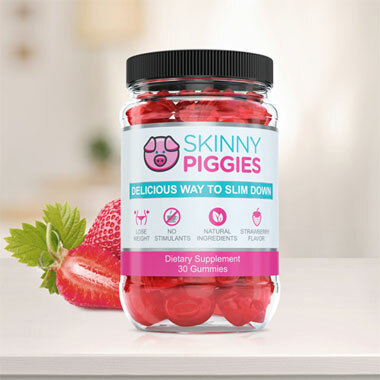 Take a look at our product Skinny Piggies, appetie suppressant gummies to help you feel full and consume far less calories. 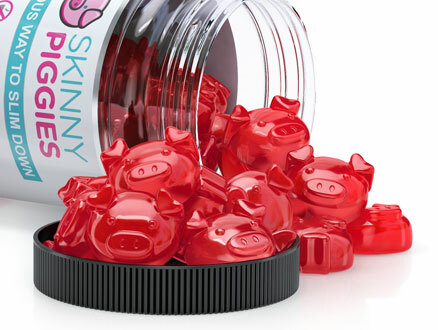 These delicious diet gummies, taken with a full glass of water before meals, help you fill up fast, and manage your diet easily.